Pluto is named for the Roman god of the underworld. Venetia Burney, an 11-year-old girl from Oxford, England, suggested the name. This is the clearest view yet of the distant planet Pluto and its moon, Charon, as revealed by NASA's Hubble Space Telescope (HST). The image was taken by the European Space Agency's Faint Object Camera on February 21, 1994 when the planet was 2.6 billion miles (4.4 billion kilometers) from Earth; or nearly 30 times the separation between Earth and the sun. 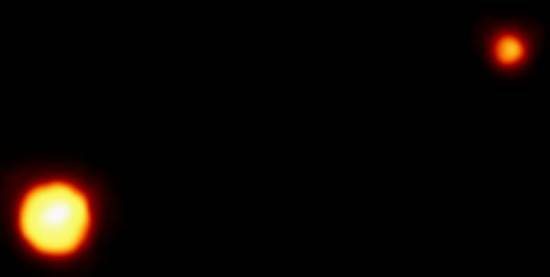 Hubble's corrected optics show the two objects as clearly separate and sharp disks. This now allows astronomers to measure directly (to within about 1 percent) Pluto's diameter of 1440 miles (2320 kilometers) and Charon's diameter of 790 miles (1270 kilometers). 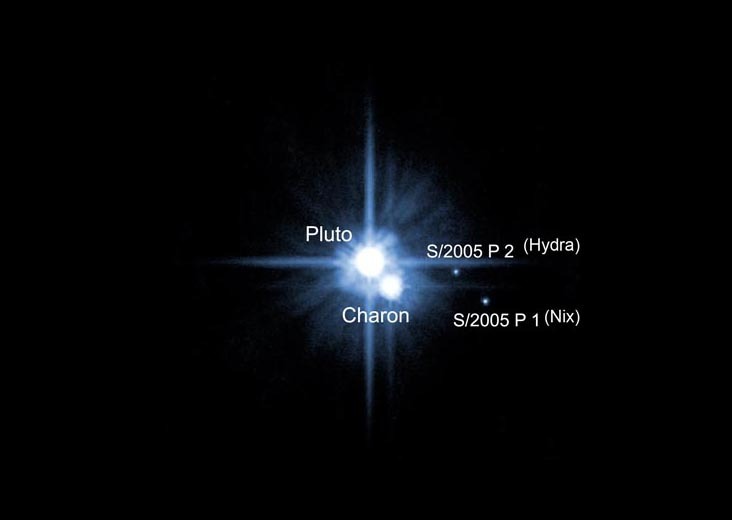 The Hubble observations show that Charon is bluer than Pluto. This means that both worlds have different surface composition and structure. A bright highlight on Pluto suggests it has a smoothly reflecting surface layer. A detailed analysis of the Hubble image also suggests there is a bright area parallel to the equator on Pluto. This result is consistent with surface brightness models based on previous ground-based photometric observations. However, subsequent HST observations will be required to confirm whether the feature is real. Though Pluto was discovered in 1930, Charon wasn't detected until 1978. That is because the moon is so close to Pluto that the two worlds are typically blurred together when viewed through ground-based telescopes. (If our moon were as close to Earth, it would be as big in the night sky as an apple held at arm's length). The new HST image was taken when Charon was near its maximum elongation from Pluto of .9 arc seconds. The two worlds are 12,200 miles apart (19,640 kilometers). Hubble's ability to distinguish Pluto's disk at a distance of 2.6 billion miles (4.4 billion kilometers) is equivalent to seeing a baseball at a distance of 40 miles (64 kilometers). Pluto typically is called the double planet because Charon is half the diameter of Pluto (our Moon is one-quarter the diameter of Earth). Once known as the smallest, coldest, and most distant planet from the Sun, Pluto has a dual identity, not to mention being enshrouded in controversy since its discovery in 1930. On August 24, 2006, the International Astronomical Union (IAU) formally downgraded Pluto from an official planet to a dwarf planet. According to the new rules a planet meets three criteria: it must orbit the Sun, it must be big enough for gravity to squash it into a round ball, and it must have cleared other things out of the way in its orbital neighborhood. The latter measure knocks out Pluto and Eris, which orbit among the icy wrecks of the Kuiper Belt, and Ceres, which is in the asteroid belt. (1) A "planet" is a celestial body that (a) is in orbit around the Sun, (b) has sufficient mass for its self-gravity to overcome rigid body forces so that it assumes a hydrostatic equilibrium (nearly round) shape, and (c) has cleared the neighborhood around its orbit. Pluto is also a member of a group of objects that orbit in a disc-like zone beyond the orbit of Neptune called the Kuiper Belt. This distant region consists of thousands of miniature icy worlds with diameters of at least 1,000 km and is also believed to be the source of some comets. Discovered by American astronomer Clyde Tombaugh in 1930, Pluto takes 248 years to orbit the Sun. Pluto's most recent close approach to the Sun was in 1989. Between 1979 and 1999, Pluto's highly elliptical orbit brought it closer to the Sun than Neptune, providing rare opportunities to study Charon. Most of what we know about Pluto we have learned since the late 1970s from Earth-based observations, the Infrared Astronomical Satellite (IRAS), and the Hubble Space Telescope. Many of the key questions about Pluto, Charon, and the outer fringes of our solar system await close-up observations by a robotic space flight mission. No spacecraft have yet visited Pluto. However, NASA launched a mission called New Horizons that will explore both Pluto and the Kuiper Belt region. Pluto and and Charon orbit the Sun in a region where there may be a population of hundreds or thousands of similar bodies that were formed early in solar system history. These objects are referred to interchangeably as trans-Neptunian objects, Edgeworth-Kuiper Disk objects or ice dwarves. Pluto is about two-thirds the diameter of Earth's Moon and may have a rocky core surrounded by a mantle of water ice. Due to its lower density, its mass is about one-sixth that of the Moon. Pluto appears to have a bright layer of frozen methane, nitrogen, and carbon monoxide on its surface. While it is close to the Sun, these ices thaw, rise, and temporarily form a thin atmosphere, with a pressure one one-millionth that of Earth's atmosphere. Pluto's low gravity (about 6 percent of Earth's)causes the atmosphere to be much more extended in altitude than our planet's. Because Pluto's orbit is so elliptical, Pluto grows much colder during the part of each orbit when it is traveling away from the Sun. During this time, the bulk of the planet's atmosphere freezes. In 1978, American astronomers James Christy and Robert Harrington discovered that Pluto has a satellite (moon), which they named Charon. Charon is almost half the size of Pluto and shares the same orbit. Pluto and Charon are thus essentially a double planet. Charon's surface is covered with dirty water ice and doesn't reflect as much light as Pluto's surface. Because Pluto is so small and far away, it is difficult to observe from Earth. In the late 1980s, Pluto and Charon passed in front of each other repeatedly for several years. Observations of these rare events allowed astronomers to make crude maps of each body. 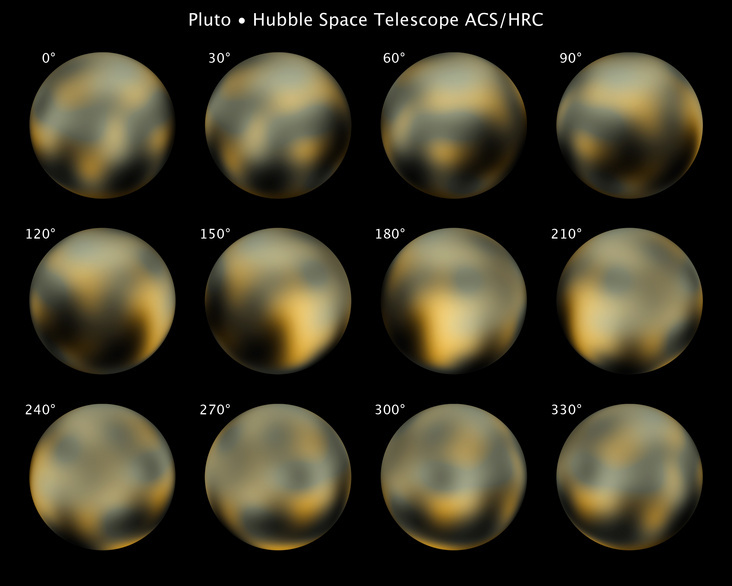 From these maps it was learned that Pluto has polar caps, as well as large, dark spots nearer its equator. By Comparison: If you weigh 100 pounds on Earth, you would weigh 8 pounds on Pluto. By Comparison: One Earth day is 24 hours.